"If you like Italy as far south as Rome, go further south. It gets better. If Italy is getting on your nerves by the time you get to Rome, think twice about going further. Italy intensifies as you plunge deeper." 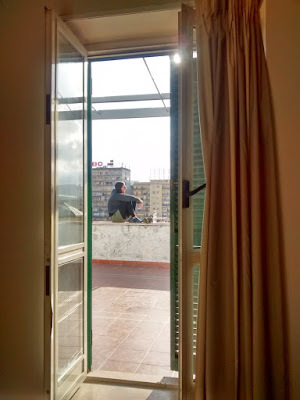 The only other city we have been to in Italy is Milan, and only for a day, so I was excited to see what Southern Italy would have in store for us. 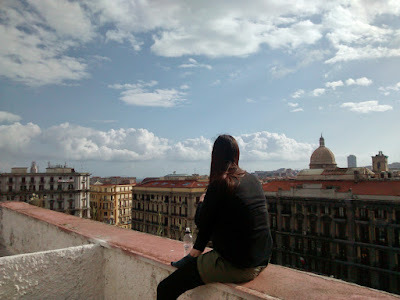 So there are a lot of people online who do not like Naples. It seems to be a place you either love or you hate, and I can definitely see why some people don't like it there. We had planned a day trip down to Sorrento, but a lot of people suggested you should stay in Sorrento and day trip into Naples if you want. I almost decided to spend a few days in Sorrento as people were talking so highly about it, but in the end I am very glad we didn't. We are Naples people, not Sorrento people. Man did I love Napoli! It is such an amazing city. One of my favorite places we have ever visited. If we decided we wanted to move away from Berlin (not that we have plans to anytime soon), Napoli would be on my list of potential new homes. That is how much I loved it there. As we were walking around after a few days Raymond said if he were to describe Napoli in one word it would be chaos. I agree with that 100%, though I would amend it to organized chaos. The first day was crazy, but once you figure out what is going on there is a bit of a rhythm to the chaos. I loved this city! Yes it is dirty. One of the dirties places I have been. There is trash in the streets. The dumpsters were emptied overnight, but by the end of the day they were overflowing with garbage. I have never seen so much garbage it was really kind of ridiculous. There are also a lot of people selling sunglasses and selfie sticks and all that stuff on the streets, but they were the mist unobtrusive ones I have ever seen. Most places they are trying to talk to you and get you to buy something, but here they just left you alone. If you went up to them they would talk to you, but if not you just walked on by. I can definitely see why people would be hesitant to walk around the city if you are not used to cities. I can see why people don't like it there, but I loved it. It is loud, people honking all the time, but it also makes sense. There are a lot of scooters and they jet down the little streets, honking so people walking the same way as them know they are coming. Or they honk before going around a corner so any traffic coming the other way knows they are coming. Once you get used to it it is actually nice. I would much rather them make noise so I know they are there than drive by my quickly startling me (like in Barcelona!). Really I think a lot of people I know would hate it there, but there is just something about it. It is loud and chaotic and dirty, but there is just something about the city that clicks with me. Most of our time there we just wandered around and it was so much fun. Walking down all the small alley streets, some lined with shops and restaurants, then turning the corner onto a residential alley street with old guys sitting outside their places, all the laundry hanging across the alley roads, it was just a great place to explore. The first day we got into the city around lunchtime so we went and got some food then wandered around. I will say the roads are so windy it is really easy to get lost. We headed out to the lunch place and it was not very far, we just had to slightly turn down two different roads, but we had to look at map a billion times before we suddenly were there. By the time we left I could find my way around, but you definitely want a map at first. The place we were staying had a giant deck. 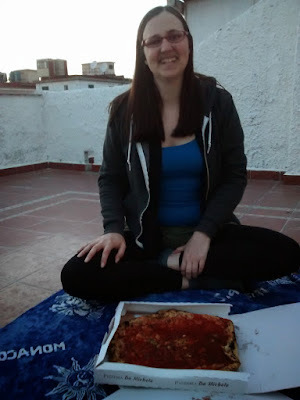 We were staying on the top floor so you could see out over the city (the above four photos are all from the deck), so that first day we had a pizza picnic out there. After walking around all day and getting up early we were tired so we just relaxed in the evening. We stayed near the main train station which is a busy area and I loved just sitting out there and listening to and watching over city. It was kind of like the beach in that I could sit all day and just watch the goings on of the people below. The square from our room at night - the traffic definitely quieted down in the evening. Most of the streets were made up of these stones. After this will be lots of photos from our wandering. Lots of alley streets, lots of water and the parks along the waterfront. The rocks along the water!